NBC is to complete its acquisition of 25% of Euronews on Thursday, with on-screen changes by the end of the year. 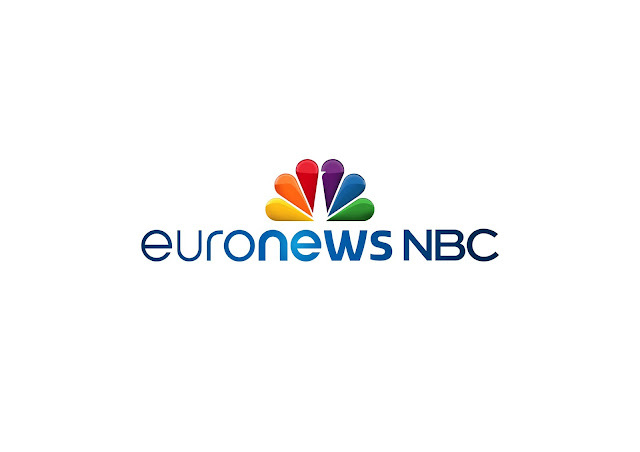 By the end of 2017, all on-screen and online branding across all platforms will have changed to 'EuronewsNBC', with the NBC peacock prominently on display (below). As part of the changes, the channel will able to tap into NBC News resources and US news channel MSNBC will be able to refer to Euronews correspondents for more analysis on European stories. The $30 million investment in Euronews will be spent on expanding news coverage and programmes on the channel according to NBC and Euronews bosses at an event unveiling the new partnership to the media. Euronews will remain based in Lyon, France but with a future emphasis on building bases in key European cities. Earlier in May, Euronews ended its 24 year old multi-language service, in favour of individual language versions, able to provide different news bulletins, programmes and advertising to different audiences. Euronews CEO Michael Peters expects the organisation to become profitable by 2020, with a doubling of ad revenue expected in the next five years. He has said he wants the channel to become "the most influential destination for European journalism." Egyptian billionaire Naguib Sawiris continues to control a majority stake in Euronews, with various European public service broadcasters - who previously had overall control - retaining a small share. Many public service broadcasters have since the creation of Euronews developed their own news services. Launched on 1st January 1993, Euronews only became widely available in the UK around the turn of the century, when ITN was the biggest single shareholder in the channel and it launched on Sky Digital.